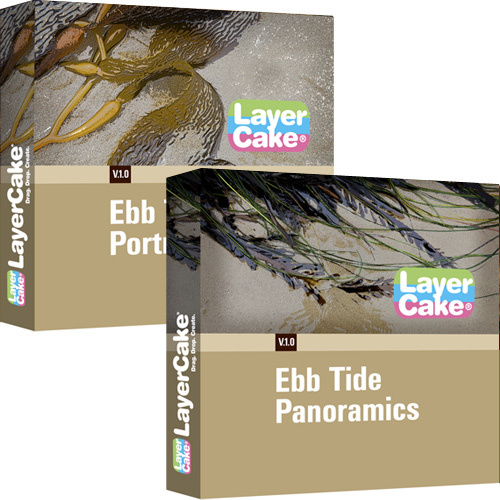 LayerCake Elements’ Ebb Tide Portrait & Panoramic Bundle enables the Creative Artist to place their subject at the beach – regardless of where you are working from. Fifty (50) professionally captured photos of the California beaches as the tide ebbs and flows open up enormous potential for Photoshop users when compositing images. Combine the Ebb Tide Portrait & Panoramic Bundle with the magic and power of the StudioMagic I & II Compositing Plug-in for Photoshop and your images will astound and astonish your clients and friends. When you add the LayerCake Elements’ Sea Cliff Portrait & Panoramic Background Bundle to the mix… you will own the beach! Tags: Adobe, America, Americana, beach, California, Coast, Creatives, Digital Backdrops, digital backgrounds, Digital Compositing, Ebb Tide, formal portraits, Graphic Design, Graphic Designers, how to photoshop, Location Sets, Ocean, Photoshop, Photoshop Users, portraits, StudioMagic, Tide. To preview the LayerCake Elements’ Ebb Tide Portrait & Panoramic Bundle’s content, please watch the slideshow below. "A GOBO is a physical stencil or template slotted inside, or placed in front of, a lighting source, used to control the shape of emitted light. In the design of an artificial environment in which lighting instruments are used, it is sometimes desirable to manipulate the shape of the light which is cast over a space or object." (Definition Source: Goboman)With LayerCake Elements' Studio GOBOS you no longer need expensive lighting equipment or even a studio to create the same dramatic look that used to require a studio. The collection includes 110 drag and drop GOBOS, of plants, tree overhangs, windows of all types and unique streetlights. Each GOBO set comes with a simple tutorial which will have you creating this glamorous look in minutes. Creating a studio look without a studio is fast and easy to learn, and use. GOBOS are just plain fun to use in Photoshop! Ultra-cool HS senior portraits; glamorous fashion & beauty portraits; exotic boudoir images. There is nothing else like them... Nothing! Click Here To Watch The Studio Gobo Tutorials! Designed by LayerCake's Compositing Wizard, Peter Hernandez, the Virtual Sets collection includes twelve (12) layered, high-resolution composite images. All have multiple layers that can be switched on or off to your liking. You can easily add your own subjects with the StudioMagic CutOut tool or redesign them to make your own signature virtual sets. Themes of this one-of-a-kind collection include: sports; wedding; fashion; scifi; whimsical; and, imaginative. Moreover, the various sets include scenes for senior portraits, high-school sports, high fashion, and just plain fun.The Peter Hernandez Virtual Sets are perfect for... EVERYONE! The virtual sets are easy enough for amateurs to use; they are a workflow time saver for pros; Photoshop users as well as users of other editing applications such as OnOne, Luminar; or, Affinity Photo; professional graphic artists and designers; and anyone who simply enjoys letting their creative juices overflow to create wondrously new imagery. The Scenic Europe Collection places the Old World flavor of Europe's narrow alleyways; winding cobblestone streets; Ireland and England's ancient castles and ruins; lush farmlands of Holland; as well as, the quaint villas and vineyards of Tuscany at your fingertips. Let your models take a gondola ride through the canals of Venice as if they are beginning their next venture to dine next to the tower of Pizza. Use the beautiful floral digital backgrounds to add the lush color of spring to your portraits and wedding albums. Two hundred, gorgeous 300 dpi floral backgrounds and floral close-ups which can be resized, cropped or customized with your favorite OnOne, Filter Forge, Nik or Topaz filters to fit any custom mat size or used as digital backgrounds. There's no new software to learn. These are image files and work with any photo editing application capable of using layers. Created by award winning still life and horticultural photographer Endre Balogh. 50 of Mr Bologh’s favorite flower images have been meticulously masked by the artist himself. Presented on high-resolution, 300 dpi layered pallets, you can easily drag and drop them on to our formal backgrounds. The collection also includes 50 custom designed LayerCake backgrounds that range from traditional to contemporary. All backgrounds are high-resolution, 300 dpi portrait size canvases; making them the perfect choice for weddings, formal occasions, families, and children. This unique virtual studio starter set, contains twelve different locations that represent new LayerCake collections, designed to use with the StudioMagic I & II Compositing Plug-in for Adobe Photoshop. You can easily add your own subjects with the Cut Out tool in StudioMagic I, or redesign them to make your own signature virtual sets, stages, billboards and marquees to place your friends, subjects, or clients on. The layered TIFF files, combined with the detailed video tutorials to guide you step-by-step make this started collection an absolute must have. In other words, the Virtual Studios, Sets, Stages, Billboards & Marquees set is for... EVERYONE!Easy enough for amateurs to use; they are a workflow time saver for pros; Photoshop users as well as users of other editing applications such as OnOne, Luminar; or, Affinity Photo; professional graphic artists and designers; and anyone who simply enjoys letting their creative juices overflow to create wondrously new imagery. Professionally photographed photos of studio backlots, sound stages, and interior studio images collection.